This is the latest revision of my motor controller using a couple h-bridge controllers I got from ST. This is an attempt to finish the robot that I started in high school. The main thing that I'm missing is a control system. I have two power window motors that are beastly and a basic frame. My original motor controller used some power bjts and never worked. This design I hope will work and be much more efficient. I am using two h-bridge controllers, VNH2SP30, from ST. They are actually designed for automotive use, such as controlling power window motors. Perfect. At 12V they can pump out a continuous 15 amps. The chips are 40V tolerant, and are ok with surges up to 30 amps. They have a current sense output and two can be used to control one motor for up to 30 amps continuous! The basic outline is designed to be a shield for my arduino diecimila. The problem with this design is that I want to add an XBee module, but stackthrough connectors are expensive and hard to come by. Samtec makes them, but my mail server is down, so I don't want to sample them. 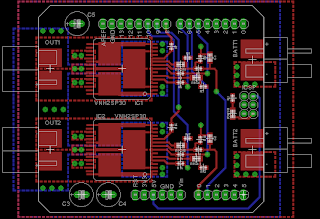 My plan is to redesign the controller with an Atmel AVR built in as well as an XBee module. With an XBee pro, this would be a great drop in replacement control system for a lot of basic RC Vehicles. Once I add some headers for sensors as well as a place to add a fan for cooling, it would be a great platform for robotics.